Types Of Construction Accidents | Pothitakis Law Firm, P.C. A construction jobsite can be chaotic and has an incredibly high chance for injury. From subcontractors, employees, and site visitors all sharing the same site, mixed with heavy machinery and dangerous tools, it is no wonder construction is one of the most injury-prone industries in the United States. While there is a high preponderance for injury and accident on a construction site, some accidents are more common than others. These accidents are typically covered under Iowa workers’ compensation benefits – regardless if the employee was partially at fault for the accident itself. Falls from Great Heights – Construction sites often require workers to work at extreme heights – whether at the top of an unfinished building, on a rooftop or even on scaffolding and tall ladders. 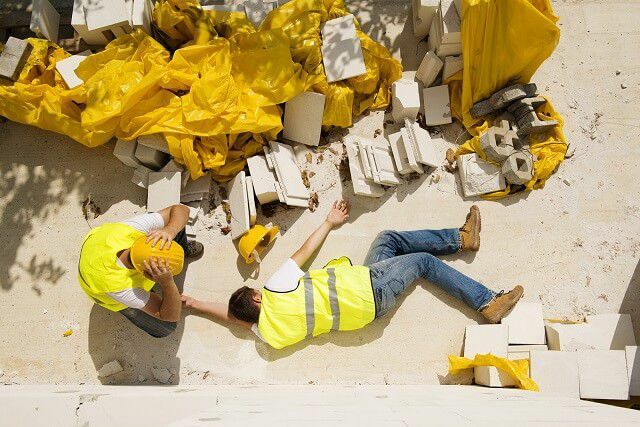 Falls, unfortunately, are one of the leading causes for construction site deaths. Slips and Trips – From equipment lying around to materials and uneven ground or holes, there are numerous hazards present on a construction site that can cause trips, slips and serious falls. These can lead to injuries that include back problems, broken bones or even traumatic brain injuries. Electrocutions – Construction sites have live, exposed wires. These unfinished electrical systems are known for causing shock and electrocution to nearby workers – especially when they are handled improperly. Burns – There are chemicals and other materials on the job site that can lead to explosions and fires. These are often because of leaking gasses, electrical systems, and unfinished pipes. Burns can range from first degree to severe, life-threatening third degree burns. Falling Objects – Materials or equipment can fall from great heights and strike workers from below – which often leads to some form of head trauma or even death. Machinery Accidents – Heavy machinery is constantly in use on a construction site – from nail guns to cranes and bulldozers. Any error, even a minor one, can lead to a catastrophic accident with this type of machinery. Overexertion – Construction workers are required to work long hours and often in unappealing weather conditions – from rain to extreme heat. It is easy for workers to overexert themselves accidentally or even become the victim of life-threatening heat stroke. Unfortunately, if a construction worker is injured on the job, it can affect their income and their entire family’s well-being. Because construction site accidents often result in serious injuries – injuries that require extensive treatment and prolonged periods away from work – the financial burden is too much for a worker to manage on their own. This is why Iowa has workers’ compensation laws – to protect employees that are injured on the construction site. Construction workers that are eligible for workers’ compensation benefits may be denied – despite their eligibility. By filing your claim with the assistance of an attorney, you can ensure your claim is not denied for a simple, avoidable error. Pothitakis Law Firm, P.C. is here to help you. Call us at 888-459-7613 or contact us online to schedule a consultation regarding your construction site accident. Next PostNext Can You File Workers’ Compensation For Heat Stroke?